If you’re headed to the Hawaiian island of Oahu, there’s a good chance you’ll end up on the streets of Waikiki in one way or another. This is a tourist hot spot, and it’s also the area where there is a concentration of shopping and hotels on Oahu. The Waikiki shoreline has a long stretch of beach that is often collectively referred to as Waikiki Beach. It’s possible to take a walk from one end of Waikiki Beach to the other. On the downtown Honolulu side, you would start near the Hilton Hawaiian Village. Then you can walk all the way to the other end where the Waikiki marine life conservation district is located. Waikiki Beach stretches around 2 miles and you can make it a walk on the beach pretty much the entire way. 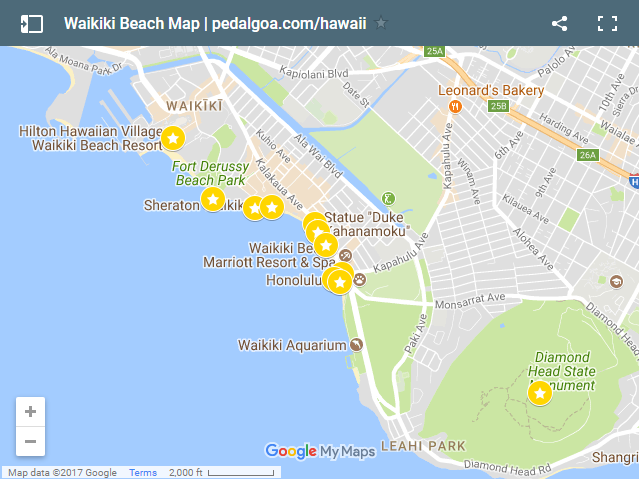 It’s an interactive map of Waikiki Beach so go ahead and click to explore! These types of maps can be best explored from a computer. But if you’re coming from mobile Pinterest, first open this page up in your web browser, and then click the Waikiki Beach map! 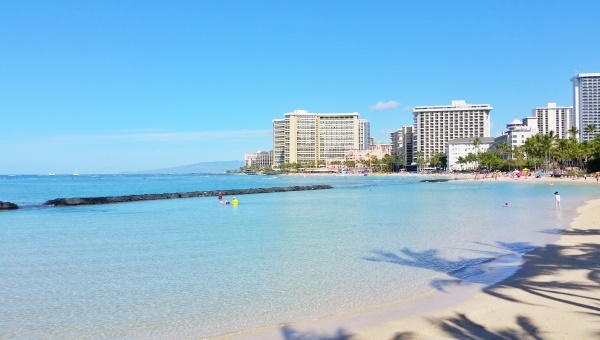 On the far end of Waikiki Beach near downtown Honolulu is the popular Hilton Hawaiian Village Waikiki Beach Resort. Do you watch Hawaii Five-0? You’ll often see scenes from right around this resort! It’s also one of the best family-friendly hotels in Waikiki. The beach out in front of this resort is the Kahanamoku Beach. Around here is where you’ll find a wide stretch of sand between the water and oceanfront hotels and buildings. All beaches in Waikiki are public, so even if you’re not staying at one of the beachfront hotels, you can head to any of the beaches. This is also the location of the Friday night fireworks in Waikiki, and you can find more information here about that. Because of the lighting of the sun, taking a visit to the Outrigger Reef Waikiki Beach Resort in the morning will get you a more silhouette scene of Diamond Head you see here. Going in the afternoon will likely get you a more colorful shot. If you’re in the area, this pier could be a good spot to test your luck to try to see turtles in Waikiki! 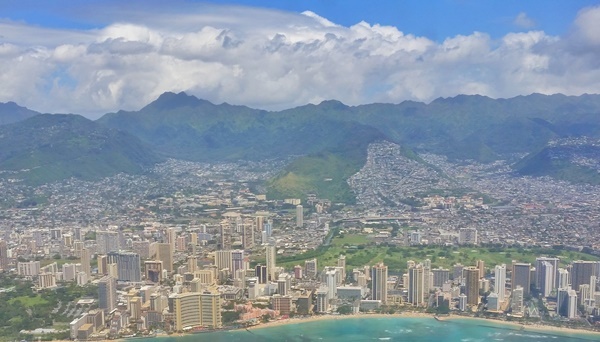 For a day away from Waikiki, the crater is also where you do the famous Diamond Head Hike to get the iconic scenes of Waikiki and Honolulu from above too. This is one of the few stretches in Waikiki that you can’t walk on the beach when you’re trying to get from one end of Waikiki Beach to another. Depending on the time of year you are in Hawaii, the path leading to the boardwalk may be closed due to strong waves or erosion. The Royal Hawaiian luxury hotel is a highly recognizable building when you’re far away. The bright pink makes it stand out and you’ll be able to point it out when you’re at a distance, like say when you’ve hiked to the summit of the Diamond Head Crater, or when you’re flying into Honolulu airport. 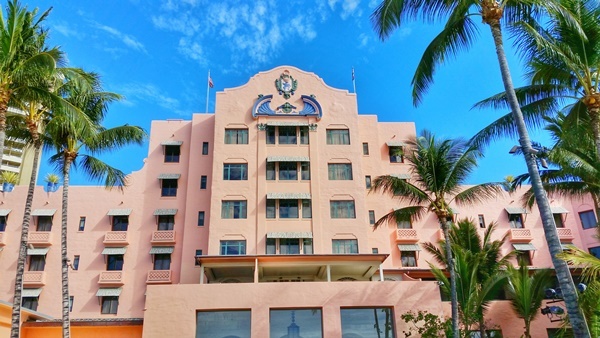 You can get this shot of the Royal Hawaiian pictured above from the beach side of the hotel. This is another iconic scene from Waikiki. 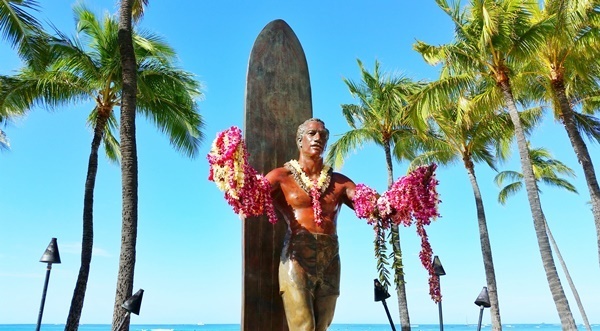 This statue honors Duke Kahanamoku as an international surfing icon and Ambassador of Aloha. He was an Olympic gold medalist as a swimmer too. 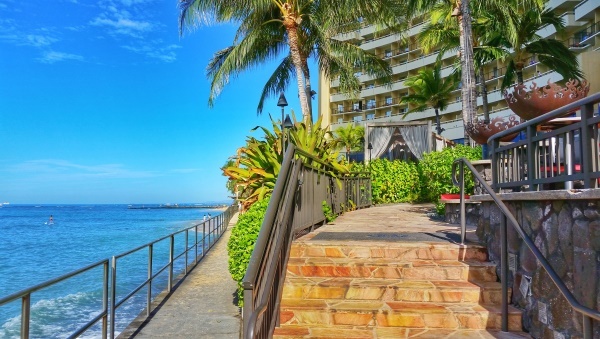 This is located in a relatively central part of Waikiki along the beach near the Hyatt Regency Waikiki Beach Resort. A few times a week you’ll have the chance to take in some Hawaiian entertainment with music and dance right on Waikiki Beach with a free hula show that begins with torch lighting and the blowing of a conch shell. 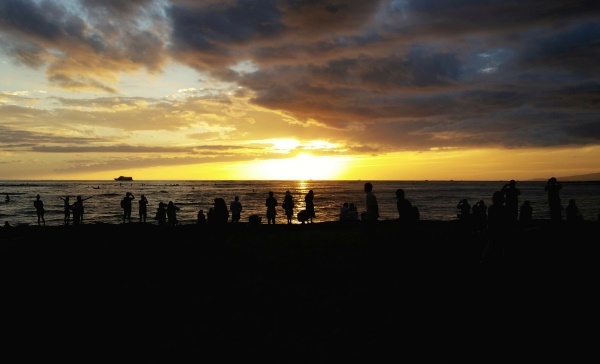 While you’re waiting for the show to begin at Kuhio Beach, you can take in that ocean sunset in Waikiki! 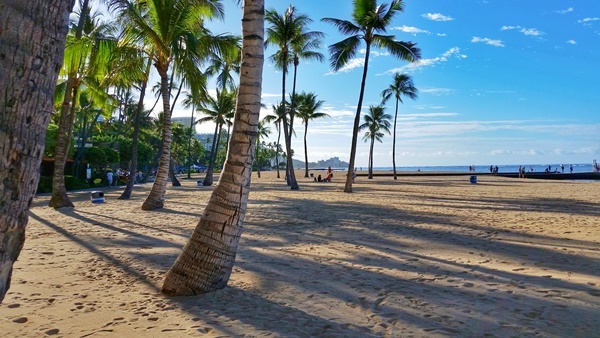 If you’re looking for a particularly kid-friendly section of Waikiki Beach, you may consider heading over to the area that is a bit more enclosed with a barrier that can break some of the waves. If you look at a map of Waikiki Beach and zoom in, you can also see this barrier marked around Kuhio Beach to know where to go. Also have a look at some of these kid-friendly tours on Oahu. If you spend any amount of time walking the streets of Waikiki, you will likely noticed a number of displays of public art in the way of statues, including the Duke Kahanamoku Statue. These are part of the Waikiki Historic Trail. 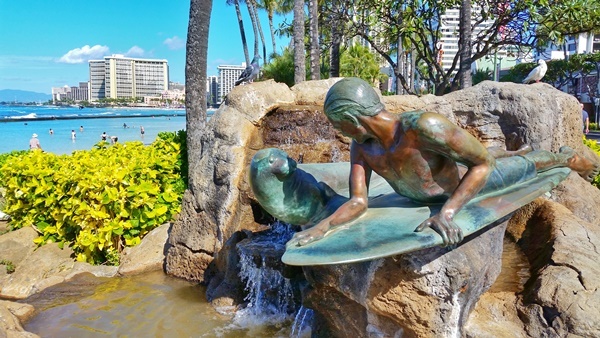 This statue above of a seal and kid on a surfboard can be found right near the Waikiki Wall. It’s said to represent Hawaiian values of respect for family and the ocean. Even if you don’t embark on a mission to cover the entire heritage trail, consider stopping to read the sign if you do see one as you’re doing some shopping in Waikiki. It’s another chance to learn a little bit more about Hawaiian culture! There are more piers further down on Waikiki Beach that can get you a different angle of Diamond Head. 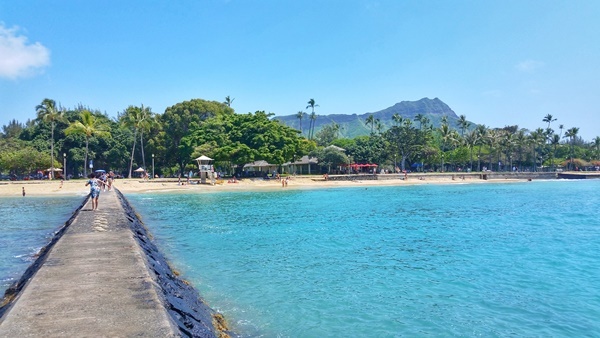 There’s the Waikiki Wall, and there’s also another pier by Queen’s Beach. They are both located pretty close to the Honolulu Zoo. And on the far end of Waikiki away from the Hilton Hawaiian Village is where one of the three Oahu marine life conservation districts is located. These types of districts mean that marine life here is more protected. 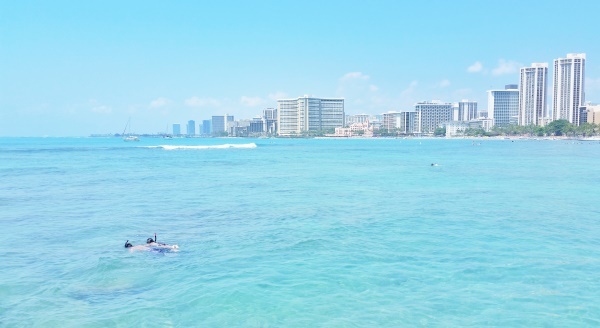 This area of Waikiki around Queen’s Beach is also known as one of the best spots in Waikiki for snorkeling. 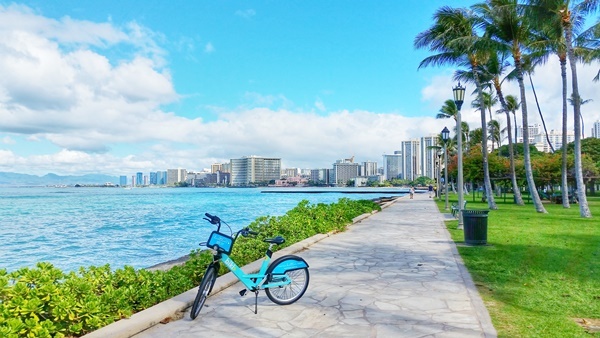 With bike rental stations to be found all around Waikiki, you can go for a coastal bike ride along the ocean with a view of the Waikiki skyline! The rental stations make it easy and convenient to rent a bike in Waikiki, which makes it perfect to go for a short cruise along Waikiki Beach! 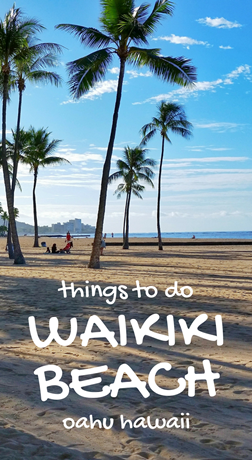 Things to maybe pack for your Waikiki Beach trip! Now, here are some things you just may want to consider adding to your Hawaii packing list for the beach!